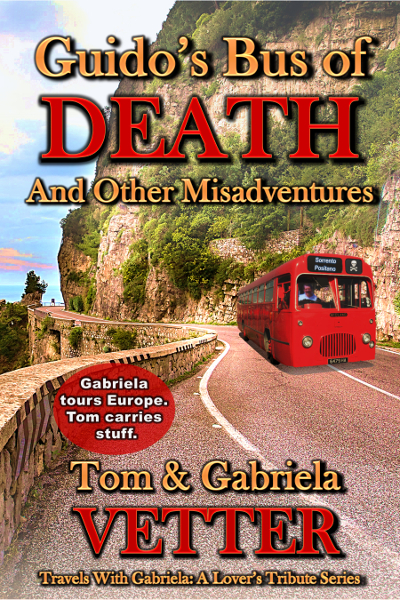 A fun and funny but TRUE travel adventure romance written from Gabriela Vetter’s daily journal and photographs, with humorous captioning and naughty color commentary by Tom Vetter. “A tale in which, Gentle Reader, an innocent American couple wanders wide-eyed across Europe amid scads of merciless admission-fee collectors and pitiless vista-spoilers through all the finer sights of the Old World, as she happily photographs every depopulated vista, and he mutters beneath an enormous pack of life support, fumbling with maps, guidebooks, and bales of not-quite-worthless Italian lire. “In action, we were hardy adventurers. Each day we set out to visit the sights of the day. Day after day—by foot, subway, cab, tram, whatever it took—we marched, from museum to church to palace to statue to shrine—10 miles every day over cobblestones, and me with full backpack. “In it I would start out with just the bare necessities: documents, money, bottled water, film, camera, and toilet paper—maybe five pounds. But Gabriela bought souvenir picture books as we went, and it got heavier all day long. And when we reached our room each evening, it weighed 30 pounds, sometimes more. Buy the book at one of these fine online booksellers!